Wardour Street, the Chinatown end south of Shaftesbury Avenue, used to house a stalwart Vietnamese restaurant, opposite the infamous Wong Kei's. Inside, paper tablecloths, strip lighting, sticky chopsticks and bland food meant I only visited a couple of times. To survive as long as they did, which is to say at least the 11 years I've worked in London, is a testament to the tourist footfall that passes through Chinatown. That's all changing, now. On the corner used to be a giant buffet restaurant where drunks and people of questionable taste could pile gloopy orange chicken atop deep red crispy chilli beef, stabbed with a flaccid spring roll on a huge plate and repeat, and repeat ad nauseum. Slowly, that's being refurbished into Shuang Shuang, a steamboat restaurant that I am most excited about (more on that later). Next door, Viet Food has sprung up. The pedigree is good; the Chef / Proprietor is Jeff Tan, of Hakkasan Mayfair and others. I had high hopes. When we arrived we were hit by the unmistakeable smell of pho, that heady, anise-laden broth that characterises the noodle soups of Vietnam. We announced our intentions and we waited. We waited some more as others who'd booked squeezed past us. Then we were asked to wait outside. So we waited even more. Finally I cracked and asked if there was actually a table to wait for, and we were sulkily shown to an upstairs sharing table. The menu is huge. Separated into 'Incoming', soups, chef's specials, pho, bun, rice... we stared at the list groggily, trying to figure out what to order. 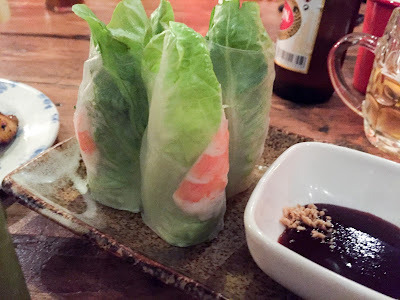 Summer rolls were big and bouncy, packed full of lettuce and prawns but not a patch on Uyen Luu's. 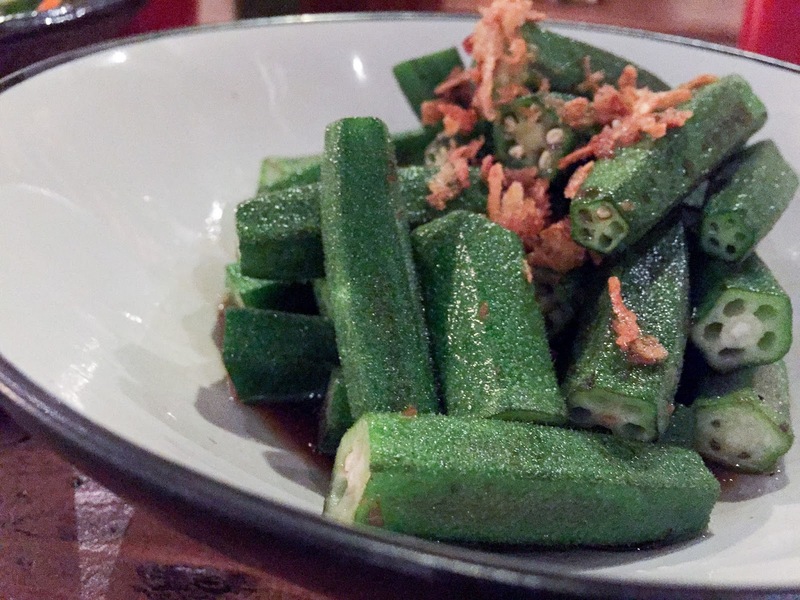 There are no interesting herbs here, just the crunch of the greens and a hoi sin-style sauce for dipping. Coconut calamari is much talked about when Viet Food is mentioned. I didn't get it. Bland, rubbery rings with a slightly sweet, crisp coating, served with a miniature bottle of sweet chilli sauce that was just a pain in the arse to extract. Grumpf. 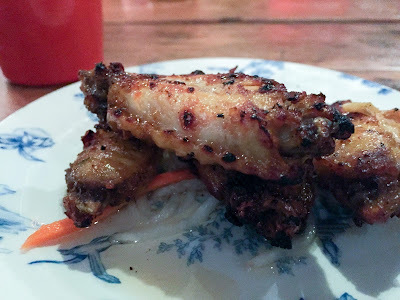 Chargrilled glazed lemongrass chicken wings were a meagre portion. Sure, they were £4.50 but it was slightly embarrassing to look at on the plate; the plate was large enough to make them look stingy. There were four of us and three joints of the wings were hard to share. The lemongrass flavour was absent. They're chicken wings! Cheap as anything. Make it a fiver and pile them on. Happily, smoky spiced quail was a whole bird (which you'd hope for £8.50), neatly jointed into 4, and indeed spiced. Lime and salt were provided to sprinkle on at whim, and we made light work of them. 'Slow-cooked haddock with Chef's special sauce' (£8) came in a claypot in, er, special sauce (are you thinking that too?). 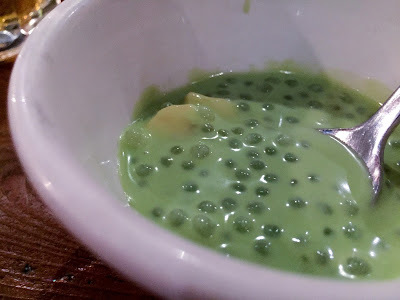 Chunks of fish, tender enough for Granny to gum her way through, came in a slightly sweet, slightly savoury cornflour-thickened sauce that was nothing to really write home about. The Pho Chin Hue, featuring slow-cooked beef in spicy broth, featured none of the promised heat but had a nice flavour. Upon its arrival we were presented with a bottle of fish sauce - "we don't use MSG in our food so you might need this for more flavour". Quite weird. I'd rather they just used MSG rather than having to add my own umami. Or I dunno, cooked it with more flavours. And before you say it, MSG is fine. 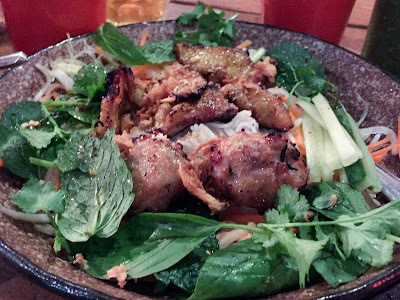 Bun Thit Nuong, which is chargrilled lemongrass pork with round noodles in a salad form, was decent with a good amount of herbs but it was presented as just a big ol' mess. I've seen street food vendors turn out a more aesthetically pleasing dish on a hot and muggy roadside. The unexpected highlight of our evening was the steamed okra with soy sauce (opening picture) £5. Now that was delicious; the vegetables were still crunchy, with a hint of soy and a sprinkling of deep fried shallots. I've never known anything made of okra to be so universally liked. We weren't exactly full by the time the food was finished, so the dessert of the day had to be ordered. Pandan sago with caramelised banana was served portioned out table-side. The banana was in no way caramelised, but we still enjoyed it. I really wanted to like Viet Food. 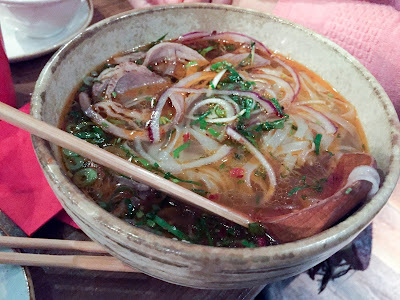 I was hoping for a West End alternative to Pho, at which recently meals have been disappointing, with dishwater-like broth, but the food felt lacklustre, the portions stingy - exactly the opposite of what Vietnamese food is about. Shame. "we don't use MSG in our food so you might need this for more flavour". Quite weird. I'd rather they just used MSG rather than having to add my own umami. Or I dunno, cooked it with more flavours. And before you say it, MSG is fine. ^^This. :) Shame the restaurant is crap but liked the post! Its menu is quite limited for other stuff, but I've still never had better pho in London than at Cafe East. It is SO hard to find good Vietnamese in London. A shame this doesn't deliver either. A real shame. Could have been great! Lizzie- I'm sure you've been to Shuang Shuang already, but if not I hope you enjoy it as much as I just did... They even have your book as part of the decor!